These Farm Heroes level 418 cheats and tips will help you beat level 418 of Farm Heroes. The objective of Farm Heroes level 418 is to reach 100% growth in 14 turns by collecting 100 carrots and 100 suns. 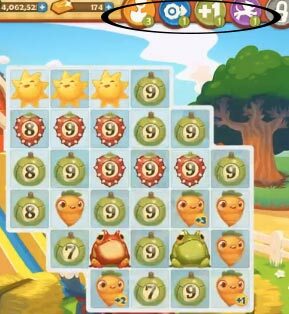 Farm Heroes Saga level 418 requires you to collect 100 orange carrots and 100 yellow suns, however you will also need to deal with the terribleness that is the cropsie bomb. A cropsie bomb has a counter that will tick down after each move you make. When a cropsie bomb’s counter reachers zero, it will explode and remove some of your cropsies. So you need to keep an eye on the bombs at all times. To get rid of a cropsie bomb, you will need to make a match with cropsies of the same color. Or you will need to make match with the same colored bomb. However, in Farm Heroes Saga level 418, there are no red strawberries or green apples to clear them out. Level 418 Cheat #2: Put those frogs to use! 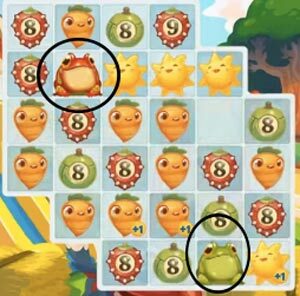 Farm Heroes Saga level 418 gives you two frogs. A frog will hop around the board and gobble up a cropsie of object of the same color. Luckily for you, you are not looking to collect red strawberries or green apples. This means you can put the frogs to use by having them swallow up as many cropsies bombs as possible. To activate a frog, you will need to create an adjacent match alongside the slimy fella. After a match, the frog will jump around the board and begin eating any nearby cropsie of the same color. To make this as efficient as possible, try and make the adjacent matches next to the frogs count towards your required cropsies. This means creating matches of orange carrots and yellow suns. You can also turn to the shovel booster to make a frog jump. Dont forget, the shovel booster will not cost you a single move. Level 418 Cheat #3: Bust out the boosters. If not played right, Farm Heroes Saga level 418 can be difficult. So there is no shame in turning to your reliable boosters. As mentioned above, the shovel booster can make a frog jump and eat. But the shovel booster can also remove any cropsie, grumpy cropsie, or obstacle in your way of creating a match. If this proves to be the case, use the shovel booster to remove any cropsie in your way of matching yellow suns and orange carrots. Another great booster to use is the color collector. The color collector will remove all of one type of cropsie from the board. 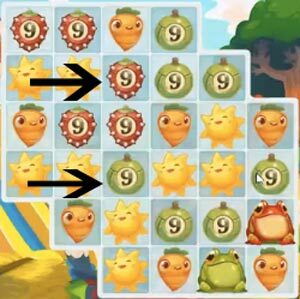 This means you should use the color collector booster on whatever cropsie appears on the board the most between yellow suns and orange carrots.